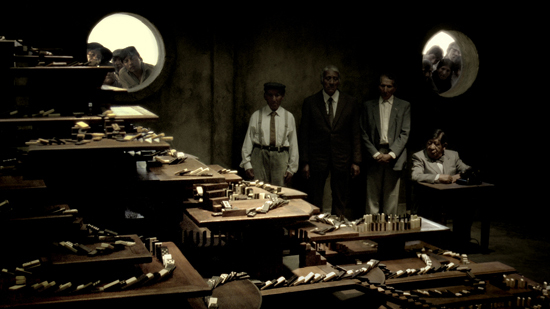 In the previous post, the entertainment effect of dominoes was explored. Although Guinness was not the first company to capitalize on the entertainment value of dominoes, they performed a very well done attempt for their marketing campaign. 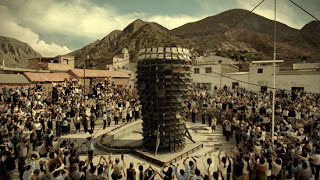 This visually enjoyable "Guinness Tipping Point" commercial was shot in Iruya, Salta, Argentina. Director Nicolai Fuglsig mentioned challenges imposed by the high altitude and the remoteness of the location. The Tipping Point commercial cost was in excess of $16 million which is equivalent to £10 million. This large price tag subsequently labeled this advert as one of the most expensive commercial in the world. It is definitely the most expensive that Guinness has ever done. There were a total of 6,000 dominoes which took 2 days to set up but just 14 seconds to topple. 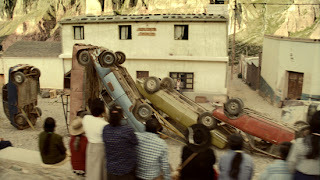 Fortunately, the car toppling section was successfully done in a single take but the number of takes the other sections required are not specifically mentioned. Director Fuglsiq did vaguely state that frequent resets of thousands of props were required. Other parts of the domino effect included 10,000 books, 400 tyres, 75 mirrors, 50 fridges, and 45 wardrobes. A total of 1000 villagers took part in creation of this commercial. This accounts for most of the total population in the relatively small village of Iruya. One of the difficulties the director mentioned was working with the massive number of villagers who did not understand the concepts of filming or acting. There are many who are doubting the total cost figures of this ad campaign but it seems about reasonable to me. There were not only raw payment to participants, salaries of professionals, cost of equipment, cost of food/supplies for everyone, cost of transporting everything but also a full 24 hour of footage captured with only up to 90 minutes of it being used. Surveying the proper location along with advanced planning also adds to the final figure. 16 million?!? Jesus. I'd hate to have to be the one to reset some of that stuff (flaming bales of hay) after a bad take. The fact that they had that much money to spend on just commercials is astounding. I wish we could get more like this.